It was Cine Europa season once again, and this year marks the sixth time that the film fest graced Cagayan de Oro City. High quality European movies were shown to the public (for free!) from October 10 to 13 at the Rodelsa Hall in Liceo de Cagayan University, drawing cinema enthusiasts from all over the city. I happen to be one of those movie fans who mark my calendar each year to head to Rodelsa Hall and catch European films galore. 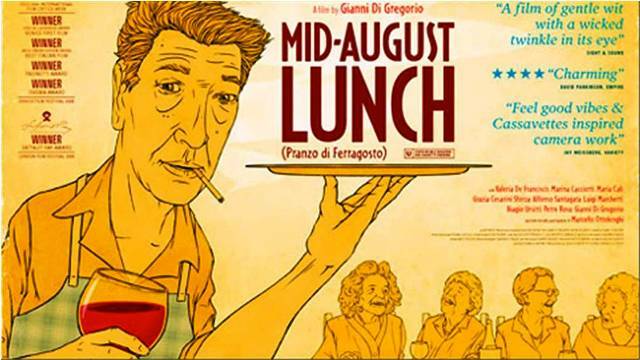 So last Saturday, I met up with a couple of friends for a quick brunch before catching an Italian comedy called Pranzo di Ferragosto or Mid-August Lunch. Here are some of my thoughts about this simple and light-hearted movie. Good thing we had a hearty brunch before the movie, otherwise my stomach would’ve been rumbling in protest. There were so much food featured in the movie! Almost each scene had some form of delicious food lurking somewhere, and an ever-present glass or bottle of wine. Ahhh. The Italians sure know how to tease not only the taste buds, but the imagination as well. Food played a great part in the storyline too. There was a funny scene with the old lady who raided the fridge for some pasta casserole, and a huge chunk of the scenes were of the main character Gianni going around town looking for ingredients for the meals he’s cooking. And of course, the title itself says ‘lunch’. I left the theater feeling hungry and craving for some pasta al forno and some good old Filetti Di Persico Con Patate. 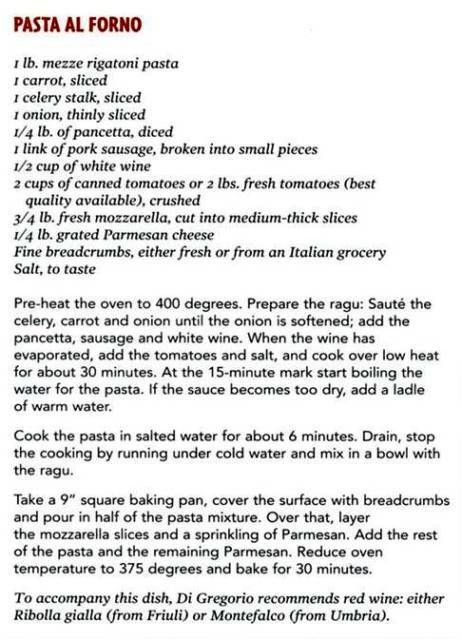 So when I got home, I immediately scoured the net for some recipes. So here, I’m sharing them with you too. Pasta al forno was the dish cooked by the character Maria. It was so delicious that Grazia (the one who’s forbidden from eating pasta, cheeses and tomatoes) raided the fridge and ate all of it! 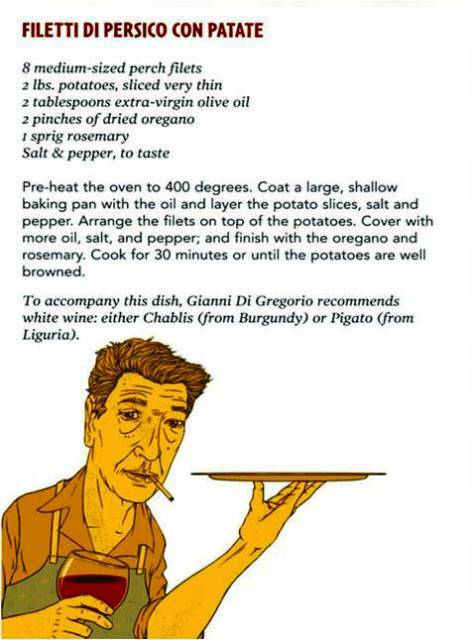 This is the recipe prepared by Gianni for their Ferragosto lunch. They had to find the ingredients from all over town, but it was totally worth it! It is known the world over that the Italians place very high importance on their family (just like us Filipinos!) The family is always considered as the center of the social structure and everyone looks after the interest of another. In the movie, we meet Gianni, the 60-ish man who lives with his 90-year old mom to take care of her. The movie opens up with him reading The Three Musketeers to his mother, with the quite spry and opinionated mom voicing out her funny comments every now and then. The story doesn’t fail to tug at your heartstrings. It’s a no-frills cinematic fare – utterly delightful in its simplicity. The focus: selflessness and love for family. It’s something Filipinos could very much relate to. A big part of the movie is all about preparing meals together and bonding while making casserole, chopping potatoes, or what-have-you. And of course, the actual meals itself. This simply reiterates the importance of eating together and talking in meals, and how it truly does wonders to human relationships. All in all, the movie is fantastic. If you haven’t seen it yet, I suggest you look for a copy of the movie, grab some family and friends, and watch it with some good food and wine. In the mood for some more Italian culture? Check out this link for a slice of Italy in Cagayan de Oro!